Having spent the last few years as a UX designer in digital and advertising agencies, I’ve diagrammed, wireframed, and prototyped a lot of different experiences. During this time, Facebook has continued it’s monolithic climb as the world’s largest social networking site. Because of this, Facebook applications, and timeline page designs are in high demand from many clients. Since I started working at Mullen (http://mullen.com), I’ve learned just how passionate brands are about interacting with their social communities, especially on Facebook. However, finding wireframe assets for Facebook templates is difficult. 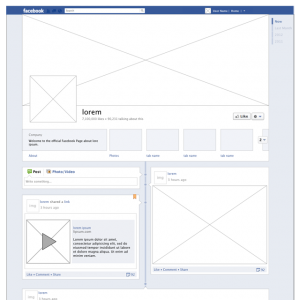 There are older Omnigraffle stencils, but Facebook’s design and framework has changed a great deal since their release. As a result, I often found myself having to hack together screenshots and shapes to fit my needs. After continuing to try and work around this problem, I started to wonder how many other UX professionals have shared in my frustration. So after talking with my manager (@helenpremium) about it, I set out to make a to-scale Facebook stencil for the Facebook Timeline Page and a stencil for Facebook Timeline Tab Apps, which takes into account the layouts. In all stencils, I used vector shapes and editable text whenever possible, as to add to the flexibility of the stencils. I hope everyone enjoys this Facebook Template and finds it useful! !